Gina Barrett is launching her new book on Create and Craft TV tomorrow (11am Channel 23 or watch live online from their website). The new Textile Trimmings book is fabulous. It includes a variety of decorative knotting technique including ball buttons, frogging, filet and needle lace plus macramé. I am a macramé novice. My favourite is the swan macramé hanger – I really didn’t think that I would be able to do it but following Gina’s fabulous instruction I am delighted with the results. I used a multicoloured satin cord and some of my handmade paper beads to make these bright and cheery bracelets. The sliding knot enables the bracelets to be taken on and off easily. 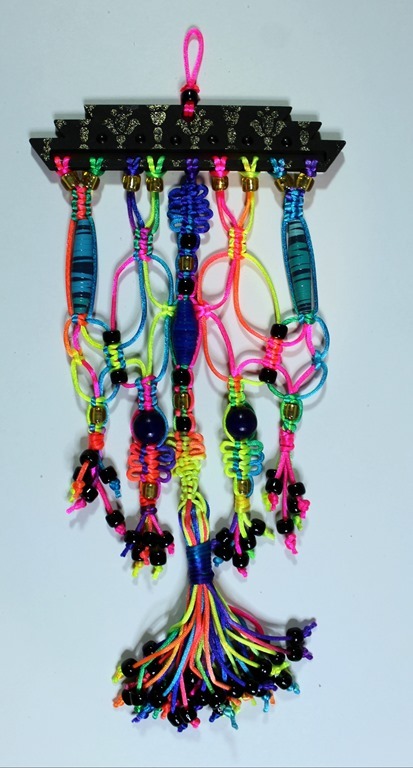 I had a bit more play with the colourful cord and more paper beads working from one of Gina’s new mini textile hangers. I had a try at the loopy braid (instructions in the book for creating the loops). I was really pleased with this one. Again I used one of the new textile hangers and decorated it with stamping (Russian Floral Egg stamp from Chocolate Baroque). 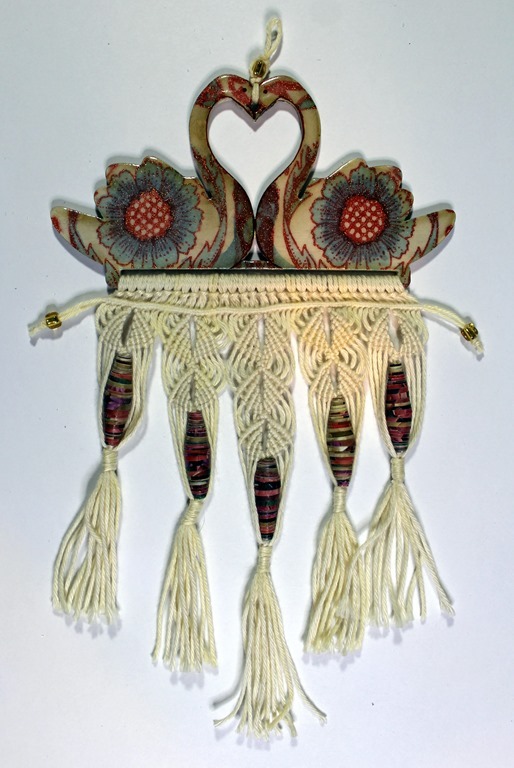 This entry was posted in Create & Craft TV, Gina-B-Silkworks, Lace, Paper Crafting, Passementerie, Textile Art and tagged Anne Waller, Gina Barrett, Gina-B-Silkworks, Heatherwell Designs, Macramé by annewaller. Bookmark the permalink.